You Have 15 Seconds to Bring a Customer to Your Door… And… then they are GONE! 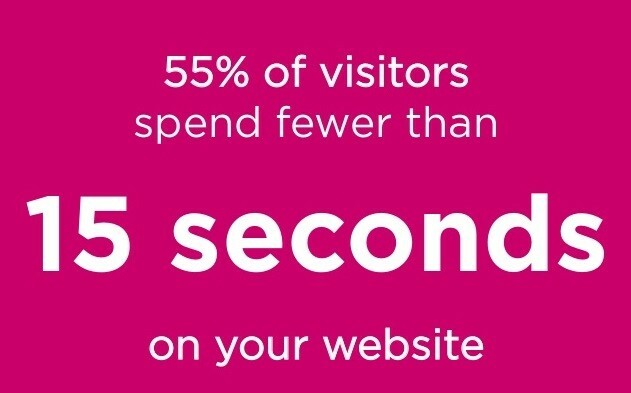 How much time do you think the average person is going to spend on your website? About 15 seconds. Seriously. No more than 15 seconds, so you have to draw them in and keep them there in very little time. How are you going to do that? Think about your website as the front door to your restaurant. If you walked up to your front door, and it looked like it was in disrepair, and neglected, and generally unattractive, how many people do you think would want to walk into your restaurant? That’s right – not too many. So, if you’re thinking about your website as your restaurant’s front door, you know that you need to make it attractive and inviting. Before we talk about what is inviting, let’s take a moment to consider what isn’t. You should absolutely stay away from flashy animation. In the first place, it’s not attractive. In the second, even though it might show up on a desktop computer, it probably won’t be visible on a mobile device. You should definitely avoid music. You know how you get in an elevator, and there’s that canned music, and you just grind your teeth together until you get to your floor? That’s exactly how people feel when they encounter music on your website. Don’t do it. Your menu is first and foremost. People want to know what you’re serving, and they want to know what it costs. If you provide a photo gallery of the menu items that you have on offer, that goes a long way to generating interest. You should also post reviews, both positive and negative. People want to know what it’s like visiting your restaurant, and they’re going to want to hear from other customers. If you get a bad review, that’s not the end of the world. Chances are another customer will come back in and say why the first reviewer was wrong. And if something really did go wrong, you can always offer an explanation and an apology. Reviews, simply stated, are believable, and it’s a lot more realistic when a customer says that you have the best food in town than it is when you say it. Include a map on your site. People need to know how to find you. Your address should be prominent, so that customers can find you using their GPS. Simply stated, make it easy. That’s what gets you the traffic, and improves your profitability. At Umbrella Consultants we help businesses, brands and marketers grow their online presence daily. Don’t be shy contact us and speak to one of our experienced marketers or see how our development team will help create the right face for your business online. Our specialty is putting your business in a manageable box so you can get back to your day to day operations. Are you looking for a Content Management System to handle your online business? Contact us today or set up a demo of Umbrella CMS. Our marketing and web development solutions help more than 7000 companies around the world by delivering great results. We can't stand average, and our clients can't either.